IT administrators measure success by the quality and speed of the services they deliver to their users. In the past, decision-making centered on which application should execute on which type of hardware in the data center. Performance-critical applications might need to execute on a specific architecture, while other less-specialized applications could run on generic servers. This heterogeneous arrangement managed costs but led to hardware silos that didn’t serve the evolving needs of the enterprise, especially when it comes to data center workloads. The advent of more powerful computing hardware combined with new software has supported the rapid evolution of today’s most competitive enterprises. By scheduling and executing various applications across more servers, more work is accomplished. Mixing data center workloads rather than creating separate application domains is key to efficiency and productivity. Specific software is typically needed only in certain phases of product development, leaving systems idle the rest of the time. 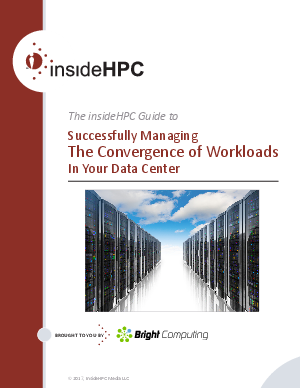 This insideHPC guide explores how a powerful scheduling and resource management solution — such as Bright Cluster Manager — can slot other workloads into those idle clusters, thereby gaining maximum value from the hardware and software investment, and rewarding IT administrators with satisfied users.